Godzilla received an upgrade! Just three years after the launch of the first Nissan GT-R, we were granted time with the 2012 model. It is not the first time we drive the Japanese sports car, but it is our first drive in the 2012 model. What changed? A lot, but very few of the changes are obvious. Purists will easily notice the exterior differences, but as a whole the Nissan GT-R still looks the same; huge, brutal and indisputably Japanese. The 2012 model is faster, much faster, and it can take corners at speeds you can hardly imagine. Add a very competitive price tag and you have a winner when it comes to the best value for money. Of course, we have to mention that the 2013 model was introduced only a few weeks ago. The new 2013 model offers even more than the 2012, but at the time of our road test the 2013 model was just a rumor and nothing more. Just to give you a small recap. 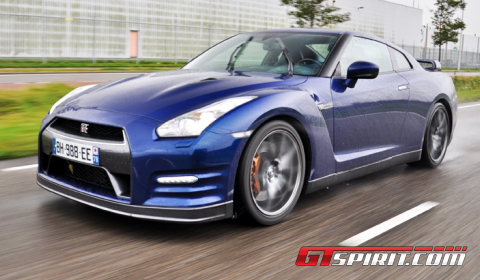 Godzilla received 15hp more to bring the total up to a round 550hp, an improved fuel economy and lower emissions. The suspension setup has been improved using unique asymmetric suspension settings on the RHD cars. The new lightweight “For Track Pack” version, currently available in some markets, such as Japan and UK, is only available on RHD cars. It inherits the DNA of the Spec-V model and turns the GT-R into a light-weight two-seater for the ultimate track day performance. Now let’s go back to the 2012 GT-R, we will report on the upgrades applied to the latest Godzilla when it is in our hands early next year. Under the 2012 GT-R’s hood is the exact same VR38DETT 3.8 liter twin-turbocharged V6 as before, but the output for the 2012 version was increased from 485hp to a whopping 530hp, while torque saw a rise from 588Nm to 612Nm. These new figures were accomplished by elevating the boost pressure of the turbocharger from 0.75 bar to 0.90 bar, tweaking the engine’s valve-timing system and altering the air/fuel ratio. Additionally, the engineers in Japan improved the air flow by enlarging the inlet pipe diameter and a section of the exhaust pipe. The brakes also increased slightly to better deal with the added performance potential. This fine-tuning is linked to the same dual-clutch automated manual transmission, an advanced all-wheel-drive system and a sport-focused suspension with adaptive dampers. The sprint figures confirm the improvements. Zero to 100km/h is done in just 3.0 seconds, using the wonderful launch control system. The quarter-mile mark comes and goes in a phenomenal 11.1 seconds. A timed lap on the Nurburgring was managed in 7 minutes 24 seconds and 22 improved by two seconds upon the record set by its predecessor. The differences with respect to the previous versions are easily felt while driving the high-performance sport coupe. 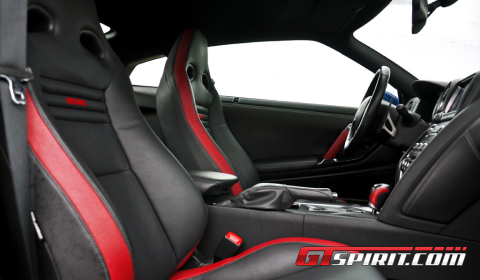 The interior refinement has improved and you can definitely feel the extra power. The first generation GT-R didn’t dissapoint in these areas, but the 2012 version takes the whole outrageous package to a new level. The other changes are more subtle. The exhaust sound track seems to be a more prominent feature of the cabin and the power train shifts more quickly through its gears to maximize fuel economy. The suspension setup has also been changed considerably. Additional supports, including a lightweight strut bar, have been installed to increase rigidity. For the front suspension, the lever ratio of the springs has been improved and both shock absorbers and stabilizer bars are modified to improve the vertical load response of the tires. The front caster angle is increased from 5°35 to 6°00 to improve tire road holding ability when turning and stability while driving in a straight line. Modifications to the rear suspension include a changed central height to a lower position in order to improve tire grip while attacking corners and to better communicate driving feel. The range of body styles and trim levels has also been increased. 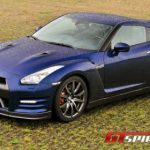 A total of four versions are available for customers; GT-R Black edition, GT-R Premium edition, GT-R Spec V and the GT-R Egoist. The versions differ with respect to the options, exterior colors, wheels, and interior refinement. Six exterior colors are available, including two new colors: Meteo Flake Black Pearl and Aurora Flare Blue Pearl (fitted to our test car). Both are special option colors. The minimal exterior differences include just a few cosmetic tweaks increasing down force by up to 10 percent. The front bumper has been redesigned with double rectifier fins and Hyper Daylight daytime running lights featuring high-intensity, white-color LED lights. These are the most visually noticeable difference for the 2012 model. The redesigned rear bumper features a lower center of gravity than the previous design, it also aids in under floor cooling. A newly designed tailpipe finish with an enlarged diameter has been added too. According to Nissan, the new forged aluminum-alloy wheels are lighter and more rigid. They are made by Rays and feature the Hyper Blue Black Chrome color and come wrapped in Dunlop SP Sport Maxx GT 600 DSST CTT tires. The interior was the major point of criticism in our previous road test. The setup needed an improvement. This time it received a carbon fiber center stack, matte black switches and a redesigned instrument panel pad. The backrests of the front seats have been reshaped. Changes to the steering wheel include a new velour-like coating on the logo and a magnesium base material for the paddle shift. A black smokey finish has been given to several interior trim pieces. All other parts stayed the same, including the 7-inch center display offering a wide variety of readouts for techies. If request you can change the interior into a high quality cabin with a choice of twenty interior colors and a personalized Bose sound system. Interiors are dealt with by Seton Company, Inc. from Muelheim an der Ruhr in Germany where master leather craftsmen sew and stick carefully selected leather by hand. Interested? Choose the Egoist version on the option list. 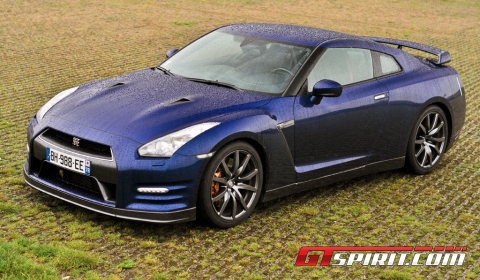 The 2012 Nissan GT-R is all you can wish for. The ride quality has improved slightly due to a revised compound and construction changes, which were targeted at better ride comfort and durability. 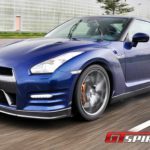 Luckily, the GT-R hasn’t become the ultimate combination between comfort and superb speed potential, the Japanese still left that sports car characteristic in it offering a slightly bumpy ride in the most comfortable suspension mode. The car’s sheer ability to take speed into corners is unbelievable. The sublime handling is not the only impression that is left, on the contrary it grows every single minute you push the GT-R into a sharp corners. The sheer acceleration is the first experience. Your head snaps back with enough intensity to cause a whiplash as the GT-R easily hits 1G of force shifting hard from 1st to 2nd gear using the paddles behind the steering wheel. The ferocious speed potential is showcased again when shifting from 2nd to 3rd. You simply cannot fathom or even register the speed. 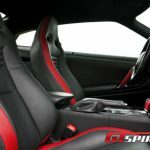 The upgrade or facelift from GT-R 1.0 to GT-R 2.0 is in every way a success, not only because of its performance figures, but even so because it has an improved well-being inside the cabin and slightly better exterior looks. With the 2013 model – also known as the 2012 model in the UK – around the corner, the GT-R story has not come to an end and that is great news with the 2012 Porsche 911 (991) targeting Godzilla with a decent amount of bravado. Photos via Jesper van der Noord.